Traffic on the 405 freeway yesterday was every bit as bad as one might dread. One of the major problems of living and working in Long Beach is that I am often a three hour round trip away from attending any reading, and the task of driving to and from a reading I am part of is hardly less dispiriting. 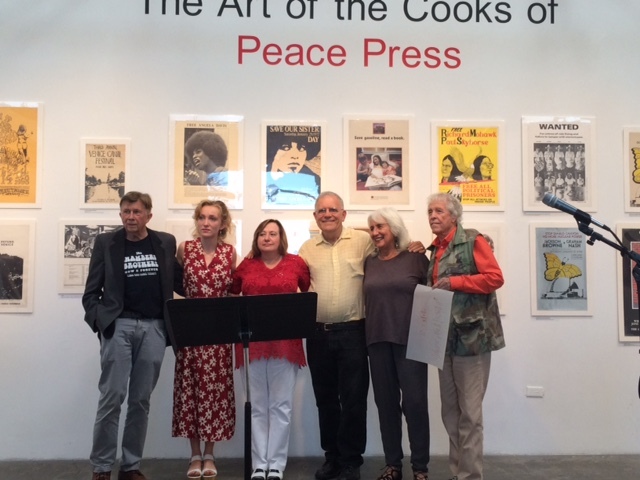 The reading itself at the Peace Press exhibition at Arena One Gallery in Santa Monica was a genuine pleasure, however. Dinah Berland, the curator of the reading, had proposed to have the poets read in reverse alphabetical order, but Julia Stein was unable to make the event, so I led off the reading with a couple of poems that I don’t read that often: “The Big World and the Small World” (from Penetralia, 1984), and “Terrorism: The View from Century City,” which was published in the L.A. Weekly in the late 1980s when Deborah Drooz was the poetry editor. Her acceptance of that poem remains one of the more gratifying moments in my writing life. I also read “Complexities,” which had been featured on the Santa Monica bus system in the late 1980s for their poetry on the buses program, and “Slow Shoes,” which was published in Thoughtful Outlaw. Memoirist Deborah Lott followed me with a profoundly moving account of being at the Ambassador Hotel the night that Bobby Kennedy was assassinated. Michael C. Ford, whose book of poems The World Is a Suburb of Los Angeles, stands out as one of the ten best books of poems I published through Momentum Press, read as mellifluously as ever. His voice never seems to age or in any way lose its ability to pivot on the precisely illuminating syllable. 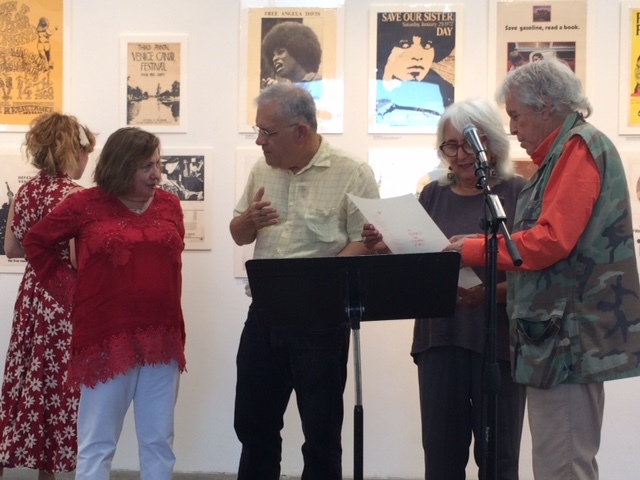 Dinah Berland, the organizer of the reading, read ekphrastic poems that were not as explicitly political as the writing of the first three readers, but which pointed to the essential presence of the stranger’s gaze as the fundamental acceptance that makes politics possible. The surprise of the afternoon was Rhiannon McGaven’s presentation. 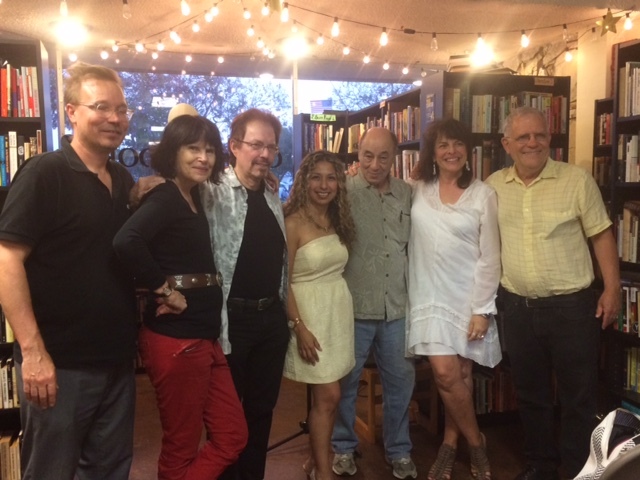 The vocalization of her poems illuminated the room with their undulating cadences. Not to be mistaken for a slam poet, McGaven’s poems feature a mature diction for someone so young, and it is most likely the case that her poems will swirl with grace on the page, too. It would seem that she has been on tour quite a bit, but this was my first hearing of her writing, and I look forward to reading her debut volume of poems. 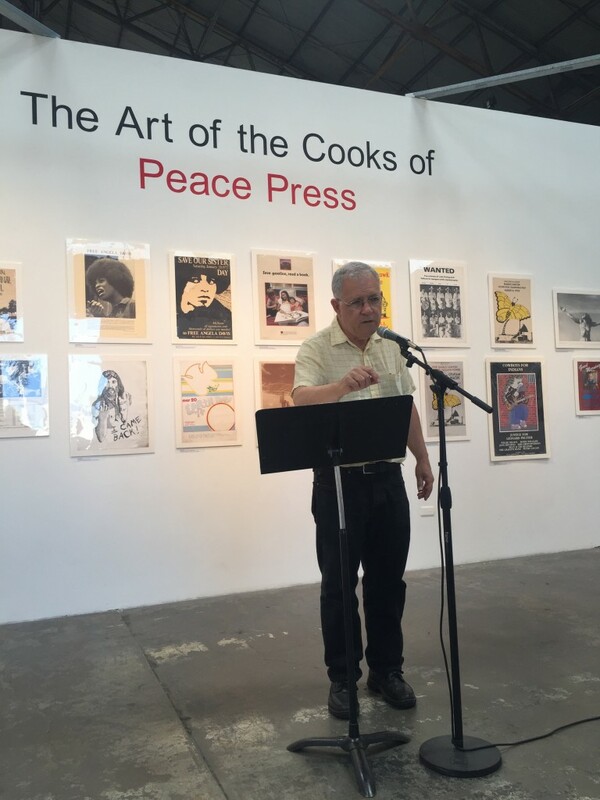 Bob Zaugh, as one of the founding spokespeople and prime instigators of Peace Press as a social, cultural, and literary force in Los Angeles, opened and closed the reading with brief remarks, and he received much deserved applause for all of his commitment to making this entire exhibit as well as reading possible. The most heartfelt applause in the course of the afternoon was most certainly for Gary Tyler, whose release two months ago from Angola prison, after over 40 years incarceration for a murder that he did not commit, was facilitated by Peace Press. Gary spoke to a small group of the audience in the dispersed conversations after the poetry reading, and his calm eloquence was a privilege to witness. He will be speaking at length at Arena One on July 1st, the final day of the exhibit. 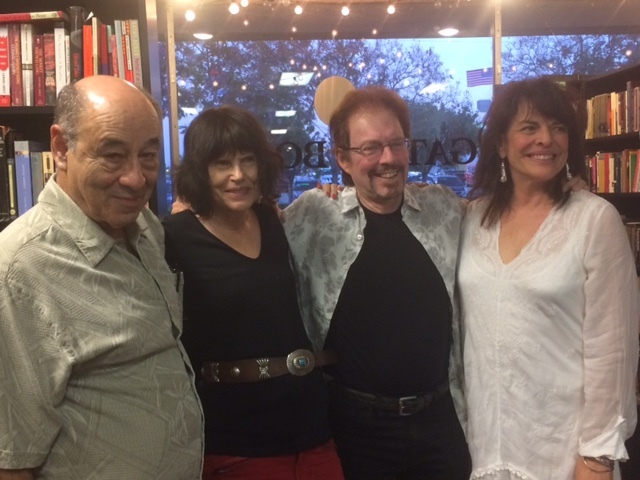 Managing to get back through even more daunting traffic on the way back to Long Beach, it turned out that we were not late to the late afternoon/early evening reading at Gatsby Books, where Suzanne Lummis, Elena Karina Byrne, Richard Garcia, Charles Harper Webb, and Cynthia A. Briano read their poems. The four best poems were Lummis’s “The Lost Poem,” which was incredibly hilarious, Byrne’s “Richard Tuttle Behind Richard Tuttle,” the title piece of Richard Garcia’s latest collection of prose poems, Porridge, and a poem by Briano whose title I can’t remember but which I did mention to her afterwards as a poem with a gorgeous logic to its images. Briano’s soprano voice gave her poems a vigorous lilt, but there was a deeper register to the poems that made me wish that they could be recorded both now and at some future point decades from now when age has deepened her register. If one could mix those tapes, one would have a duet worth listening to repeatedly. One of the poems that Webb read seemed to be a revision of an e-mail scam satire that I remember hearing in 2010 at the Avenue 50 gallery. It was funny then, and even funnier now, and should help his forthcoming book of poems rebound from the slough of Brain Camp.